HealthCare.gov. An overview of the requirements placed on businesses under the law. Search our Catalog by Keyword for: Small Business or Entrepreneurship. An NC Live resource: a good starting point for researching business ideas. Go to: nclive.org -> Browse Subjects for Business & Management, and scroll down to Reference USA. Help determining the ideal location for a business. from Business Link North Carolina, a division of North Carolina Department of Commerce. Click on link to complete an online application. Learn about the essential elements of a business plan, how to make yours stand out, find templates, and learn why you need one. Several articles on writing a business plan from Entrepreneur magazine. Search our Catalog by Keyword for: Business Financing. A Guide to Financial Resources for Small Business in North Carolina. View details, terms, and eligibility requirements. The Federal Trade Commission, the nation's consumer protection agency, has prepared this booklet to explain how to shop for a franchise opportunity, the obligations of a franchise owner, and questions to ask before you invest. Many business opportunity promotions are scams that take people's money up front and fail to deliver on the promises. Learn how to protect yourself when buying a franchise. Search our Catalog by Keyword for: Home-Based Business or by Subject for Home-Based Business Series. From medical billing and envelope stuffing to assembly and craft work, learn what questions to ask to determine if a work at home job opportunity is fraudulent. Information for taxpayers who file Form 1040, Schedules C, E, F or Form 2106. Federal Trade Commission: videos and articles available. 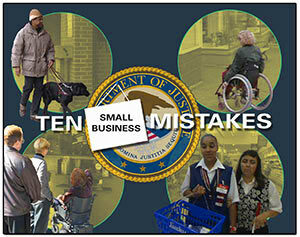 This thirteen-minute video identifies common mistakes that small businesses make when trying to comply with the ADA and addresses the importance and value of doing business with 50 million people with disabilities.